Posted on Fri, Feb 3, 2012 : 10:39 p.m.
Two long-time University of Michigan School of Nursing health care clinics closed their doors Friday, moving the medical services they have offered to non-profit, community based Packard Health Inc.
Friday was the last day North Campus Family Practice, 2364 Bishop St., and Community Family Practice, 1230 N. Maple Road, were open to patients. Two University of Michigan nurse clinics closed Friday. Beginning Monday, patients will be seen at Packard Health, which has two locations. The two U-M clinics were staffed by nurse practioners, a registered nurse who has received advanced training, who are also U-M faculty. The new partnership between the U-M School of Nursing and Packard Health insures that patients will continue to receive care, Kathleen Potempa, dean of the school of nursing, said in a press release. It was Potempa’s decision to close the clinics and enter into a partnership with Packard Health. The two U-M clinics logged a total of about 4,200 patient visits a year, said Thomas Biggs, interim CEO of Packard Health. Packard Health expects to pick up up 70 percent of those visits, he said, and has hired one of U-M's nurse practioners and will add another nurse practioner through a contract with U-M, Biggs said. Packard Health will also serve as a training site for U-M nurse practioner students, he said. “Determined to preserve this resource for the coming years, we aligned with Packard Health as a means for gaining the necessary operational and administrative support,” Potempa said. According to the press release, “a challenging economic climate” prompted the School of Nursing to look for other options in order to continue to offer care. “The clinics aren’t closing, they’re merging,” said Susan Gorny, interim manager for marketing and communications for the School of Nursing. 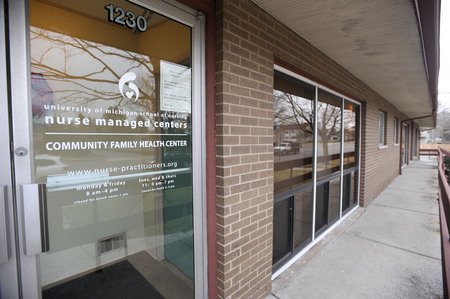 While a letter from Potempa and Biggs said a nurse practioner health provider at Community Family Practice would join the staff at Packard Health, the status of the rest of the staff at the two clinics was unclear. Biggs said Packard Health would not be hiring all of that staff. Packard Health is a community based health care clinic offering services to insured and uninsured patients on a sliding scale. It also offers payment plans. "We consider ourselves a safety net clinic," Biggs said. Packard Health is located at 3174 Packard Road, with another office at 501 N. Maple Rd. Medical records of patients who have not notified the clinics where they will receive medical care will be stored at the U-M Health System’s Health Information Management Office. Patients whose coverage is through Washtenaw Health Plan must now receive their care at Packard Health. Sun, Feb 5, 2012 : 7:35 p.m. In 2014, (provided that the healthcare insurance laws remain in place) the &quot;growing ranks of uninsured&quot; will be instantly replaced by the newly INSURED. To accommodate the significant number of persons who will have access to healthcare, new federal regulations expand the role of nurses in unsupervised clinical practice. That sounds like a good plan on paper, but there aren't enough qualified nurses (nurse practitioners/advanced practice nurses) in the US to take on this new role. By combining forces with Packard Health, the University is consolidating its qualified nurses with existing community resources to more effectively deliver healthcare to patients and still provide practice opportunities for NPs in training. &quot;Universal&quot; healthcare provides insurance coverage for everyone. It doesn't guarantee a clinic on every corner. Sat, Feb 4, 2012 : 9:01 p.m.
@Jim Osborn You hit the nail on the head. Potempa received more than 12% raise this year, bringing her salary to $341K+. The community pays higher property taxes on account of the U (poor pay via rent), but when it comes to adjusting her budget Potempa looks outside the school. Makes perfect cents! What about the $2.6 billion unrestricted assets? <a href="http://www.annarbor.com/news/unrestricted-assets-at-u-m-campuses-grow-42-percent/">http://www.annarbor.com/news/unrestricted-assets-at-u-m-campuses-grow-42-percent/</a> And, what about all the construction and expansions? Really?? Four clinics merged into two, with one maybe two additional nurses on hand, and no additional administrative staff. That's supposed to be sufficient for the growing ranks of uninsured? In a &quot;challenging economic climate&quot; - whose?- the UM's or the community poor? (Ms. Miller, kindly tell us how much UM saved by closing these clinics.) &quot;Determined to preserve this resource for the coming years...&quot; What resource, a convenient site to train UM nurse practitioners? What is that value to the Nursing school? Those students pay big bucks to be trained! The partnership &quot;insures patients will continue to receive care.&quot; Isn't it a responsibility not to abandon patients? Sounds like the &quot;safety net&quot; just got smaller. This makes economic and administrative sense - two clinics with the need for all the administrative support at each location. Small practices continue to merge into larger ones to reduce costs and the same thing is occurring with hospitals as the smaller ones continue to close and the larger ones continue to grow larger. Sat, Feb 4, 2012 : 7:47 p.m.
That silly, silly hospital head could be replaced with another who makes 10% less, do a better job, and the savings pay for this clinic and more. Sat, Feb 4, 2012 : 4:33 a.m. Sat, Feb 4, 2012 : 7:46 p.m. When UM is involved, it can persuade its many doctors to volunteer. Now, this may not happen as often. That silly, silly hospital head could be replaced with another who makes 10% less, do a better job, and the savings pay for this clinic and more.